The month of July is my month for the Sew Connected 3 Quilting Bee. Which means that I went and bought enough fabric for a quilt (hopefully), and I am sending it out to the other 18 people in the group. I am so excited for this quilt since I have not made one like it. I got the fabrics in the mail today, along with an instruction sheet, so I thought I would post the instructions here too. We will be making String Blocks. I can't wait. Each of the four blocks is 7" so when you sew all four of them together the block should be somewhere around 13". Click here to see an example of a string block. You DO NOT have to have all of the lines match up to create squares like this tutorial does. I have no problem with it not matching up so please do not stress at all, but if you can and want to match up awesome. Also you do not have to have the whole strip/string be the same fabric, you can have a pieced strip/string. I will be using mainly Park Slope by Erin McMorris. 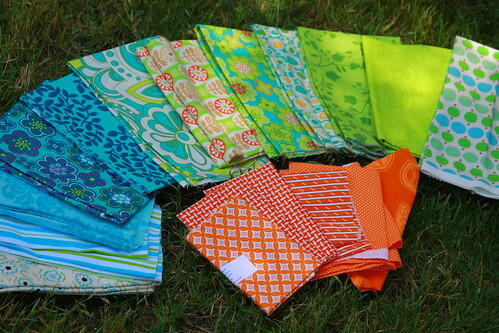 All of my fabrics are turquoise/aqua and what I would call a limey green with some small amount of orange thrown in. The one thing I do require is that you use the solid white fabric that I will be sending as a string/strip in each of your fours squares so that when you sew them together there is white in all sections of the square, but the white doesn't have to be in the same place in each of the 4 sections. 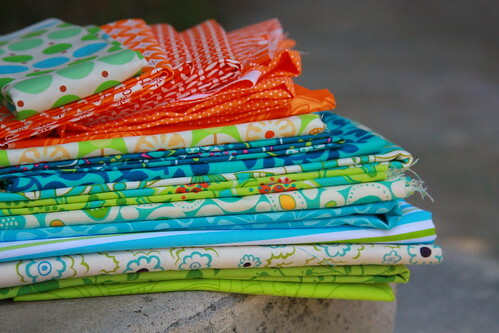 Oh almost forgot......Adding in fabric.....I am going to say that you can add ONLY fabric from the Park Slope by Erin McMorris line in the aqua/blue, green and orange fabrics......NO PINK. You totally don't have to add anything, even though I would love someone if they have any of the leaves in a circle orange print to be added (I wish I had that one). Have Fun! I am so excited to see these done! great proyect! the fabrics are amazing! Can't wait to see how it all pans out! You know I'm excited to make this block. It's going to be such an awesome quilt! LOVE your fabric selections. 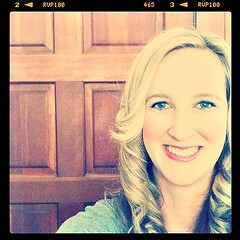 Bright and cheery! Hope you get back some amazing blocks! great fabrics!! your quilt is going to be beautiful!! Oh I cannot wait to see it, your fabrics are amazing!!! This is going to be fun to work on! I just made a pillow using this tutorial and had a lot of fun with the project. I love your selection of fabrics! I found the circles in orange for you!! That's going to be one awesome quilt! A girl?!? Loads of fabric to be bought for sure. P.S. I love the fabric you picked. I'm mailing your block today. I added some leaf dots to the block and I'm sending some extra fabric.